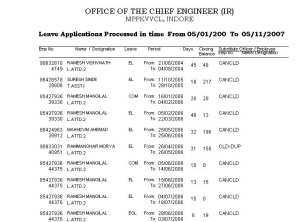 MADHYA PRADESH VIDYUT VITRAN COMPANY LTD., INDORE(M.P), INDIA. The software is developed for MPPKVVCL(Madhya Pradesh Paschim Kshetriya Vidyut Vitaran Company Ltd.) a Govt. of Madhya Pradesh owned electricity distribution corporation. The software aims at automating a process, of sanction of leaves for 3000 employees working at MPPKVVCL. Rules and Regulation for leave sanction are taken care of, and leave account for the employees deputed at multiple locations is maintained on central server. Project Title : Industry Transaction Processing System. The software is implemented to keep a track of Work in Process at manufacturing units, and also to keep a track on purchase/sales orders, dispatch and inventory. 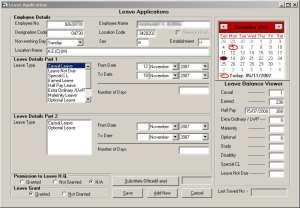 The software also includes an accounting module that is used to maintain accounting books at head office. Further, the software includes reports that work as a Decision Support System. Graphs and charts enhance and simplify making decisions related to inventory management, reorder level, sales, profit margins etc. These have brought new perspective to the organization whereby they can see sales with relation to particular time of the year, wastage, margins, expense and growth. The project can be termed as a mini ERP. This system is developed for industries and laboratories that require dust-free environment. 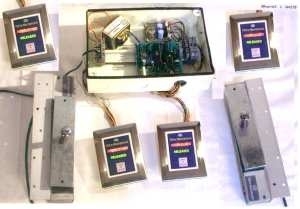 This system consists of two door magnets, and two pairs of SS panel switchboards that work in tandem to keep dust from entering together with the person entering the room.